Available for a limited time only, our exceptional hazelnut & chocolate praline pud is supporting locals around our Colombian cocoa farm. For each pot you buy, 5p goes towards encouraging and training entrepreneurs – energising communities and improving lives. At Pots & Co, we believe a proper pudding should steal the meal. So we hand-make ours in their individual ceramic pots, from our kitchen in London. That way, we know you’ll always get a perfect pud. Our potted puds are simply brilliant – they’ll make mealtimes and events truly remarkable. With everything from fruity numbers to chocolatey creations, we've got something for everyone. That's pudding sorted! All our puds come in the colourful, ceramic pots we bake them in – that’s what gives them their signature depth and intense creaminess. And they’re pretty useful around the house, too. 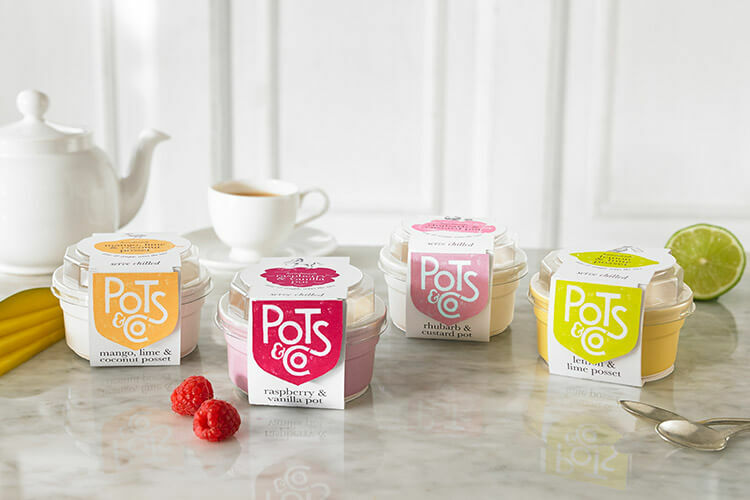 Pots & Co was born out of a wish to create exceptional puds using the finest ingredients – for everyone to enjoy. And ever since, we’ve been passionate about making puddings the proper way. From wonderful Willamette raspberries to Alphonso mangoes, our fruity puds are packed full of the finest ingredients. Rich, velvety and frankly irresistible – our chocolate pots are real crowd-pleasers. So for potted puds made with top Colombian cocoa, you know where to come. Craving our delicious pots? Have no fear – they’re available in the fridges of all the best supermarkets. Want to stay in the loop? Give us a follow, and you’ll pick up all the stories we’ve got to tell about our brilliant puds. Just pop in your email address below, and we'll send you all the latest news and updates about our exceptional puds.